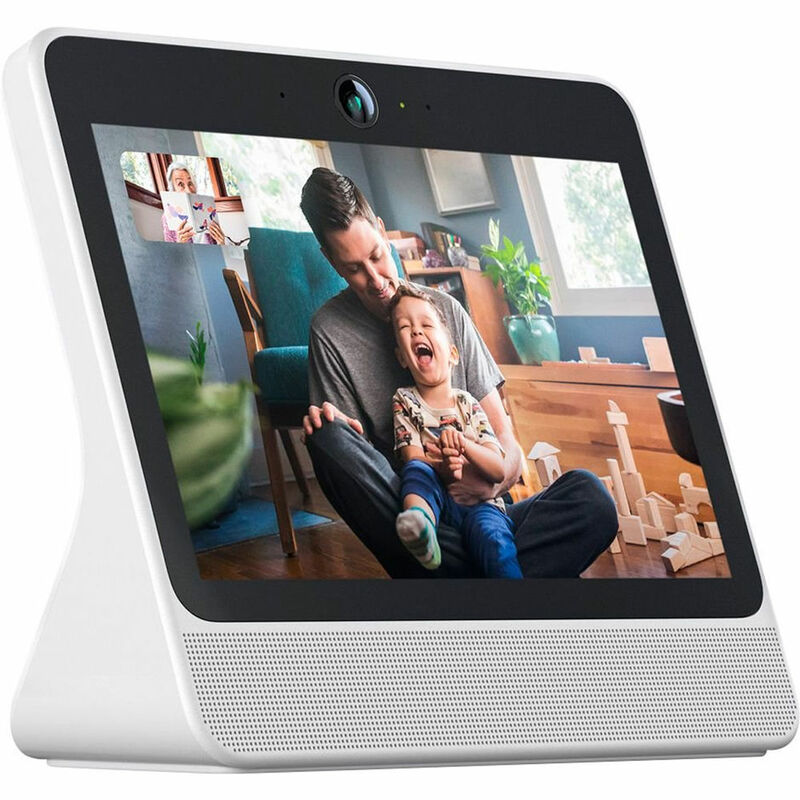 Video chat with friends and loved ones with the white Facebook Portal. It features a 10.1" 1280 x 800 touchscreen with a four-microphone array, plus a 720p camera with 8x zoom. The camera can follow you around the room and zoom in or out to keep those in the room in the frame. The four-microphone array allows the Portal to pick up your voice from nearly anywhere in the room, and with Amazon Alexa built-in, you can ask the Portal questions, set timers, add items to your shopping list, control your compatible smart home devices, and more. A camera/mic off switch disables their functionality, and a physical lens cover is also included to further alleviate your privacy concerns. Note: Content acquired via certain apps may require subscription to a service. Not all services are available in all areas. Wi-Fi connectivity and a Facebook account are required for initial setup. US English is the only supported language at this time. Certain Alexa- and location-based features will have limited functionality outside the US. Please see the manufacturer's website for more information. Whether you're moving around the kitchen or chasing the kids through the living room, the Portal's Smart Camera adjusts to follow the action. As more people enter the room, the Smart Camera is engineered to automatically widen to keep everyone in view. The Portal is designed to enhance the voice of whoever is talking, wherever they move in the room, and minimize unwanted background noise. You can completely disable the camera and microphone with a single tap. This mode physically disconnects the camera and microphone, and they can't be turned back on without pressing the button again. In addition to the camera/microphone off button, you can block the camera lens with the included camera cover. To limit Portal access within your home, you can set a 4- to 12-digit passcode to keep the screen locked. Changing the passcode requires your Facebook password. When you turn on Home and Away Mode, the Portal will use your mobile phone and Portal's location to know when you're home and available to call; you'll still get calls on Messenger when you're away. Facebook doesn't listen to, view, or keep the contents of your Portal video calls, so your Portal conversations stay between you and the people you're calling. For added security, the Smart Camera uses AI technology that runs locally on the Portal, not on Facebook servers. The Portal's camera does not use facial recognition and does not identify who you are. Only Responds to "Hey Portal"
Like other voice-enabled devices, the Portal only sends voice commands to Facebook servers after you say, "Hey Portal." You can delete the Portal's voice history in your Facebook Activity Log. Use your voice to easily call friends and family on Messenger – calls can be made to and from smartphones and tablets, and you can bring up to six other people into a group call. With Story Time on the Portal, you can seemingly become some of your children's favorite characters as you read along to their stories with music, animation, and augmented reality effects. Also, if friends or family also have a Portal, you can listen to your favorite songs, albums, or playlists together as if you were in the same room, without delays or feedback. Enjoy music, videos, news and more from a growing list of partners. The Portal has Amazon Alexa built-in, so you can ask a question, set a timer, add items to your shopping list, control your compatible smart home devices, and more with just your voice. When you're not on a call, the Portal can display your Facebook photos and videos. You can also see when your closest contacts are available to connect and get birthday reminders. Play your favorite music through the two 5-Watt full-range drivers of the Portal. Box Dimensions (LxWxH) 11.6 x 10.2 x 4.0"